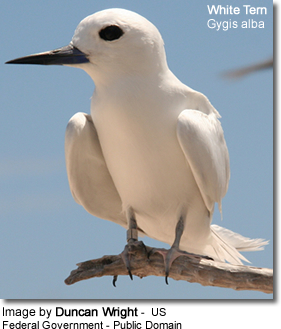 The White Tern (Gygis alba) is a small seabird found across the tropical oceans of the world. Sometimes known as the Fairy Tern although this name is potentially confusing as it is the common name of the Fairy Tern Sternula nereis. 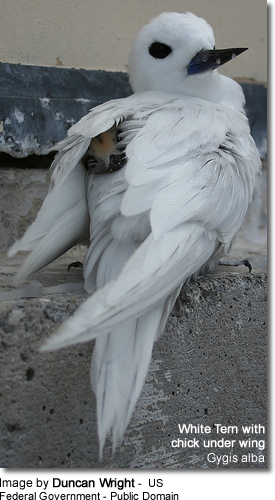 G. a. leucopes, the Pacific White Tern (G. a. candida). Additionally, the Little White Tern (G. microrhyncha) was long and often is still included herein as a subspecies G. a. microrhyncha. 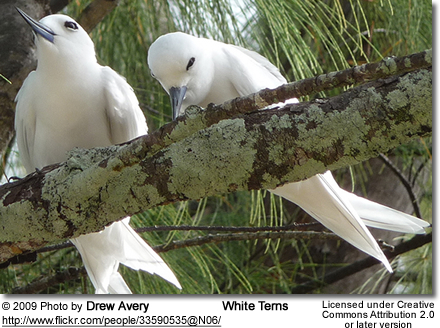 The White Tern is a small, all white tern with a long black bill, related to the noddies. It ranges widely across the Pacific and Indian Oceans, and also nests in some Atlantic islands. It nests on coral islands, usually on trees with thin branches but also on rocky ledges and on man-made structures. The White Tern feeds on small fish which it catches by plunge diving. 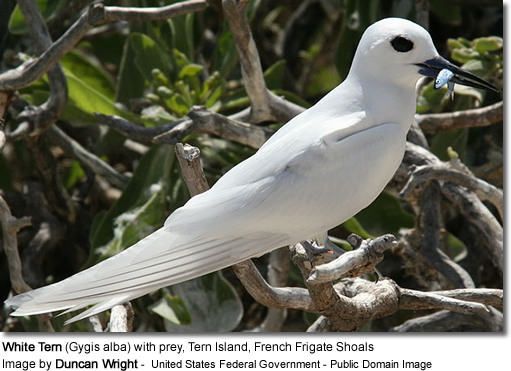 This small tern is famous for laying its egg on bare thin branches in a small fork or depression without a nest. This behaviour is unusual for terns, which generally nest on the ground, and even the related tree-nesting Black Noddy constructs a nest. It is thought that the reason for the absence of nests is the reduction in nest parasites, which in some colonial seabirds can cause the abandonment of an entire colony. In spite of these benefits there are costs associated with tree nesting, as the eggs and chicks are vulnerable to becoming dislodged by heavy winds. 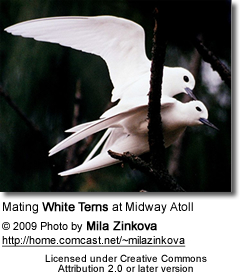 For this reason the White Tern is also quick to relay should they lose the egg. The newly hatched chicks have well developed feet to hang on to their precarious nesting site with. It is a long-lived bird, having been recorded living for 17 years.